Nestled almost unnoticed, quite at the end of Bansko is situated one of the most amazing churches, not only in the town but also in the country. The Holy Virgin Church or the Assumption was built during the second half of the 18th century so that we can enjoy it today, and, until the Holy Trinity Church was built, it had played a part of a parish church for the local population. However, its history didn’t start in the 18th century, but a long time before that. According to the researchers, in the place of the today’s church, there was a medieval Christian temple, which most probably had been demolished during the Ottoman invasion in the country. An evidence for the veracity of this statement is both the discovered stone walls – 1.2 meters thick (a construction style that was typical for the period before the Ottoman invasion), and the stone blocks that had been reused in the building of the present temple. On some of these stone blocks, the researchers found an inscription of years 1959, 1711, 1773, 1774 which reveals many interesting details about the building architecture of the church itself. Thanks to these inscriptions, that the builders of the one-nave, one-apse church, left, it becomes clear that the building of the Southern and the Eastern walls was completed in 1953. From the inscription between the narthex and the naos, we find that the partitioning wall was erected in 1774 by Hadji Yoan. During the same year, the church was reconstructed and a narthex was annexed to it. When the church was erected, Bansko even didn’t exist as a settlement. In the region, there were several small neighborhoods situated highly in the mountain, isolated from each other. Only one neighborhood was in the low and just there, in Buga Mahala, the Church of Assumption had found its place. In fact, the choice of place for building the Temple is not accidental at all. The builders simply chose a place that was surrounded by tall, century-old trees, which concealed the God’s temple and ensured its protection in these troubled and dangerous times. The story of the church is really interesting but still more interesting (and non-standard) is its architecture. The Holy Virgin Church is deeply ‘buried’ in the earth (as according to the demands of the Turks, the Christian temples should not rise higher than the mosques). The temple is one-nave, with a double-sided roof. It was built of bricks and stones, and the so-called ‘cellular structure’ could be seen in places. The walls in the length of the temple reach a height of 2 meters and those in the widths reach 4 meters. On the Eastern and Western walls, there are small apertures (embrasures), and the only windows are the ones on the southern wall of the Church. The entrances are two – the west one and the south-east one; one of them is made of solid iron, while the other is wooden and covered with metal strips and decorated with metal nails. The apse is small and narrowed towards the top, and the naos and narthex are separated by a three-door wall. An interesting fact about the building of the Temple is that the builders first built the main building, and only later was the altar finished. Why this construction method had been chosen, today we can only guess, but most probably, we will never know what had prompted that decision. 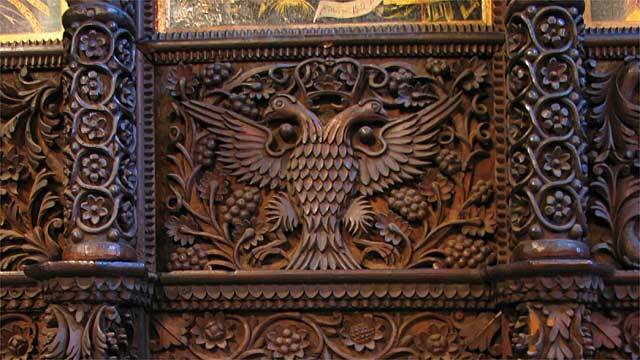 What most impresses in the small church, however, is the unique wood-carving of the iconostasis of the bishop’s chair. The ornaments of flowers, birds, animals, vines, and roses are filled with such a great finesse, sense of detail and patience that Professor Bozhkov called it ‘Grandpa Turpen’. The experts’ opinion is that this incredible work of art is of the Master of the Debar Art School, since, at that time, only representatives of that Icon-painting School did wood-carving tracery. The style of the unknown master, specialists find in the workmanship of the iconostasis in the St. George’s Church, in the region of Pazardzhik, as well as in the iconostasis in the Church of the Holy Sepulcher at the St. Luke’s Hermitage in Rila Monastery. Interestingly, the iconostasis did not fit with the dimensions of the Church, so the southern side had to be extended further. The icons which were in the Church of the Holy Virgin were made by two great masters from the famous Bansko Art School – Toma Vishanov – Molera (the founder of the Bansko Icon-painting School) and his son Dimiter Molerov. Unfortunately, in 1958 a fire broke out into the temple, which destroyed many of the icons and part of the iconostasis. After the fire, only two of the icons remained – ‘St. Ivan Rilski’ and the ‘Virgin Mary’ icon, the rest of the icons needed restoration, so they were tucked away and replaced by their copies. There are allegations that in 1930, part of the iconostasis in the south side was dismantled and secretly exported abroad for sale, then replaced by iconostasis from another church, but these allegations haven’t been proved. It is absolutely worthwhile visiting the Church of the Holy Virgin in Bansko, so do not miss enjoying its incredible story and architecture, while you are visiting the town. We mentioned that the Church is situated in Buga Mahala (Buga neighborhood) which in the past had been the only neighborhood at the foot of the mountain. 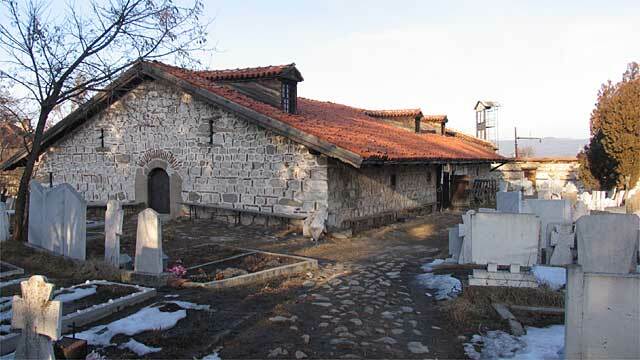 Today Buga Mahala has remained at the end of the town and the Church itself is located in the cemetery park of Bansko. If you are a guest of Lucky Bansko Hotel, to reach the Virgin Mary Church, it is less than a three-minute journey by car. The Church is open and functioning, so you will not only be able to see it but also, can light a candle, pray to God for the health of your relatives (or worship the dead). What else to see in Bansko? 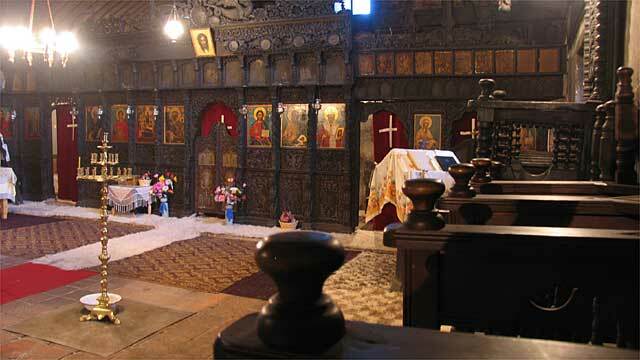 The Orthodox Church is one of the symbols of the town and one of the first sites to be visited by every tourist. The Church was built in 1835 and the whole population of Bansko took part in its funding and building. The church is three-nave pseudo-basilica that impresses with its dimensions of 35 meters in length and 22.5 meters in width. The wood-carvings, the decoration (and most probably the ambo and the iconostasis) were made by Velyan Ognev, and most of the icons were made by Dimitar Molerov. The Holy Trinity Church is located in the central part of the town and is open every day from 7:30 am to 5:30 pm. There is no entry fee. This is one of the great sights of Bansko, which is worth visiting. The house is located on the town square. Arranged in two floors is the museum exposition which tells about the life and activity of the poet who was born and grew up in this home. The House-museum ‘Nikola Vaptsarov’ is open every day and the opening hours are 8:00 am to 5:30 pm. The price of the ticket is 3 leva for adults. There are discounts for children and students. The house is from the Renaissance era and has the typical architecture of its time. It was a gift from the Bansko residents to master Velyan Ognev who had painted the Holy Trinity Church. The master accepted the gift from the Bansko residents, with gratitude, and turned the house into a real work of art painting it both inside and outside. The opening hours of the Velyan’s House are 9:00 am till 12:00 pm, and from 2:00 pm till 5:00 pm. Saturday and Sunday – closed; the price of the ticket is 3 leva. If you want to know more about the architectural and ethnographic museum, you can pay for a guided lecture, the cost of which is 2 leva. Neofit Rilski was born and lived in this house until 1811. The home of the patriot has been preserved in its authentic form, and it will be interesting to you to learn a little more about his deeds. The opening hours of the architectural historic monument are: 9.00 am to 12.00 pm and 2 pm to 5:00 pm; no Closure day. The entry fee is 3 leva and a guided lecture – 2 leva. Although the building was built only in 2008, it fully re-creates the cell in which Paisiy Hilendarski lived and wrote the ‘Slavonic-Bulgarian History’. The spiritual-historic center was built in the place where the Paisiy’s own home was. The site is open from 9:00 am to 1:00 pm and from 2:00 pm to 5:30 pm. No Closure day. These sites are some of the 100 National Sites and if you have a Tourist Book, you can take a stamp at your visit. The seal of the Vilyan’s House and of the Neofit Rilski museum is in the house-museum ‘Nikola Vaptsarov’, and the Holy Trinity Church stamp you can get in the church itself. This is the oldest tree in Bulgaria and it is worth going 8 kilometers from Bansko to enjoy it. The century-old tree is 1300+ years old and has impressive dimensions of 7.8 meters in circumference, 26 meters in height and 2.48 meters in diameter. If you walk from Bansko in the direction of Dobrinishte, almost halfway between the two cities, you will see the sign of the Basilica of the Nameless Town, and, if you continue on the way to the location of St. Nicholas you will reach the Nameless Town. The city was discovered quite accidentally during the restoration activities of the Chapel ‘St. Nicholas’, which is located on the hill of the same name. It turned out that under the hill there was a large, ancient town situated on an area of 25 – 30 decares. Since the archeologists haven’t found anything so far to guide them to the town’s name, it remained known as the Nameless Town.